It just released its farm subsidy database for 2015 and 2016. The new information reflects the demands of the 2014 farm bill. $32.2 billion is the total cost of federal crop insurance, disaster, and conservation programs. $14.5 billion of this went mainly to growers of corn, soybeans, wheat, cotton and rice. $12 billion went to crop insurance subsidies. $3.7 billion went for conservation. $2 billion went to disaster assistance. Deline Farms Partnership was the #1 recipient with $4 million in commodity subsidies. The Navajo Agricultural Products Industry was #2 with $2.3 million. The website is interactive. You can click on states and counties. Tomkins County, New York, where Ithaca is, got $25 million in federal subsidies. It’s fun. Check it out. EWG also released it’s Double-Dipping report on how taxpayers are subsidizing farmers twice for crop losses. It organized dozens of farm organizations to sign a letter calling for greater investment in agriculture through the farm bill education-and-research title. III. Representative Chellie Pingree (Dem-Maine) is also working on farm bill issues. Many people are working on farm bill reform. It needs it. Politics makes strange bedfellows, as documented by Politico in a report on the coalition of unlikely allies working to reform the farm bill. Let me start with my favorite: The American Enterprise Institute (AEI), not exactly a bastion of radical thought. The AEI puts out a series of thoughtful position papers, remarkable for their clarity, on a range of farm bill issues: Agriculture in Disarray. 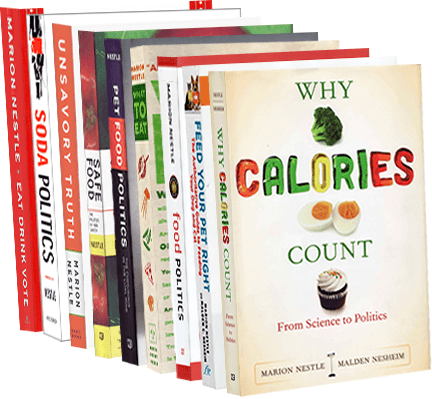 To date, 6 have been published. You may not agree with these American Boondoggle viewpoints, but you will have a good chance of understanding what the arguments are about. It’s Thanksgiving week and I can’t think of a better time to talk about the farm bill. My starting place for thinking about this topic is a short article I wrote for Politico about the previous bill: The farm bill drove me insane. Now, House member Earl Blumenauer (Dem-Oregon) has come up with an alternative: the Food and Farm Act. Here’s how he explains it to Civil Eats. n a video, he calls for reform and for fixing the existing farm bill. 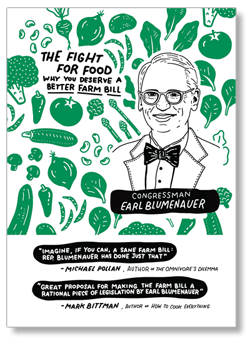 To make this even easier, his campaign put together a small handbook in cartoon format: The Fight for Food: Why You Deserve a Better Farm Bill. This is a terrific beginner’s guide, the best way I’ve ever seen to get started. The main difficulty with the farm bill for everyone other than a lobbyist is that the issues get wonky right away. Even the handout on the highlights of Blumenauer’s bill has lots of wonky details and requires close attention. Possible? Maybe, if we can ever get the political will. Here’s something positive to support. Get to work!